Sea Breeze- 100% Cool Cotton Classic Shirt so perfect for the inbetween temps! MADE IN USA. Cool, breathable 100% Cool Cotton Classic Shirt from Sea Breeze - Relaxed and casual shirt that's just right for your activities. Fashioned in soft and ever-popular, all-weather, 100% breathable Crinkle Cotton. In modest >WOMEN'S SIZES, S, M, L, XL See more detail in Size Selections. 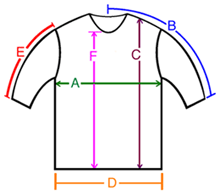 A: Chest / Bust circumference 39-40" 42-43" 43-44" 45-46"
B: Sleeve length from center of neck to end of sleeve 26" 26" 26.5" 27"
D: Hem circumference 44" 47" 50" 51.5"
E: Sleeve length from shoulder to end of sleeve 16.5" 17" 17" 17.5"